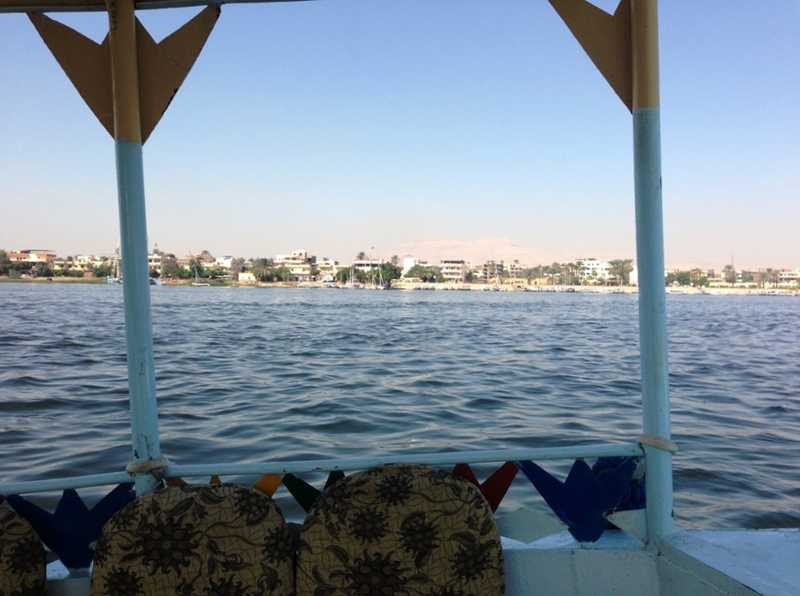 Staying on the East Bank in Luxor or the West Bank, there is always a reason to cross the river – the river Nile. If you are staying on the East Bank in Luxor and you want to visit the Valley of the Kings, or Medina Habu you have to cross the Nile, and if you are staying on the West Bank you must cross the river to visit Karnak, or Luxor Temple, or if you just have to go to the bank, or do some shopping in the Bazaar, or enjoy the sunset with a cocktail on the terrace of the Winter Palace Hotel, you have to cross the Nile. And to do that there are several choices. 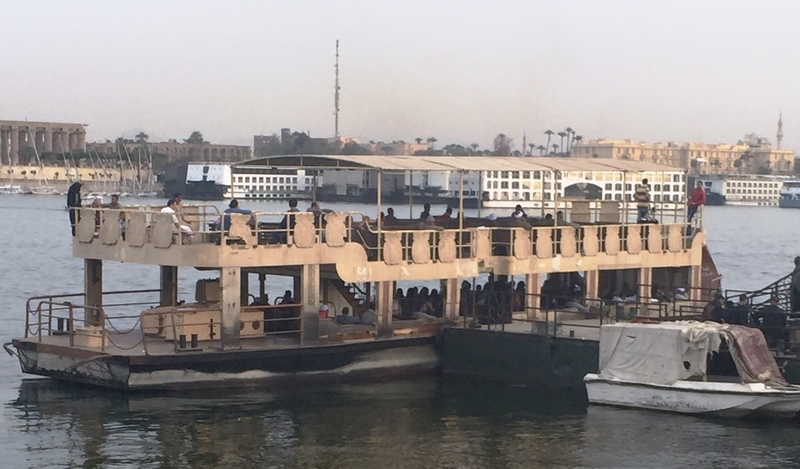 The most interesting one, putting you in contact with the daily life of Egyptians, is the public ferry (Baladi Ferry) It cost one Egyptian Pound, about 20 cents, and takes 10 minutes to cross, leaving you close to Luxor Temple when coming from the West Bank. You won’t see too many tourists on this ferry, but you will see the locals coming and going about their life. But if you are not interested in the local flavor, you can go by motor launch. There is no specific dock where to catch one, but the owners of these boats pick you up wherever they can find you. Price? 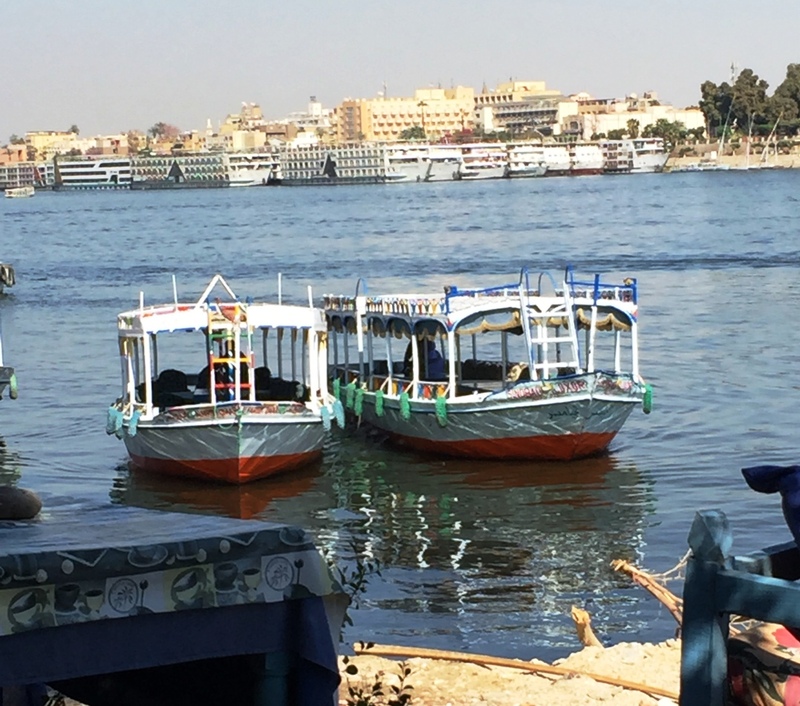 This has to be agreed upon before you step into the boat, and varies from 20 – 60 Egyptian pounds depending where you want to be dropped off, or more if you want to go further up or down the river. If there is no real dock, a blank is put down from the boat to the shore, and for safety the boat owner holds a long pole in one hand which he pushed against a stone or solid ground on the shoreline, and no worry, holding onto it you get on board safely. 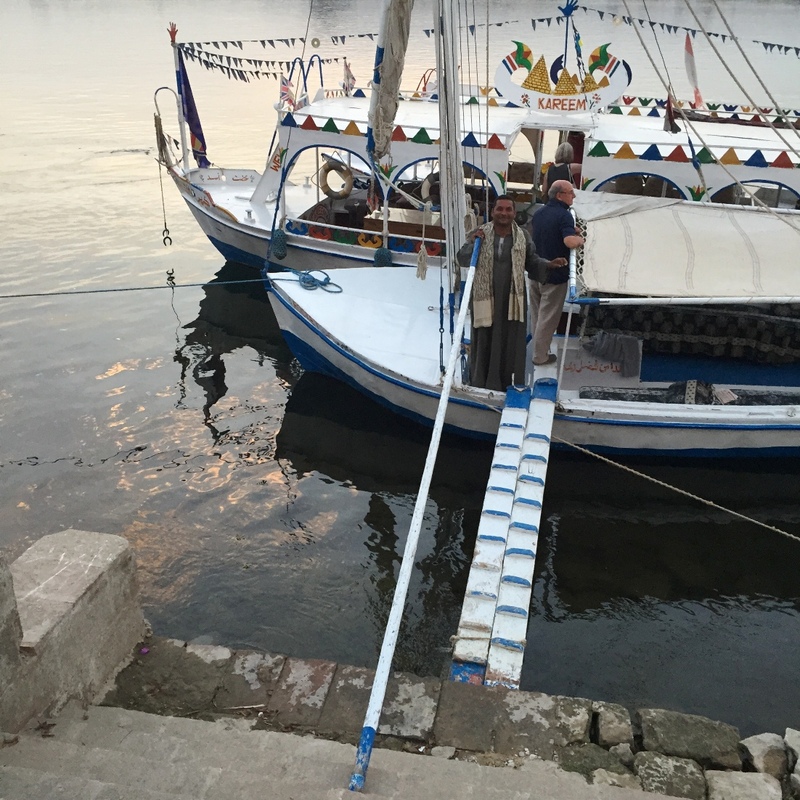 ….and if you ever want to come back to Egypt, as the saying goes, you must drink the water of the Nile. Now I don’t know about drinking? 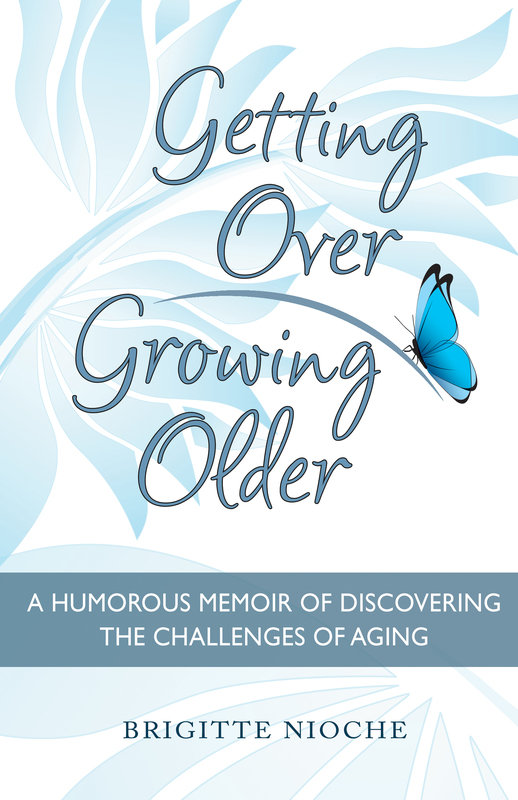 But submerging my hands in the cool, green water has always worked for me! 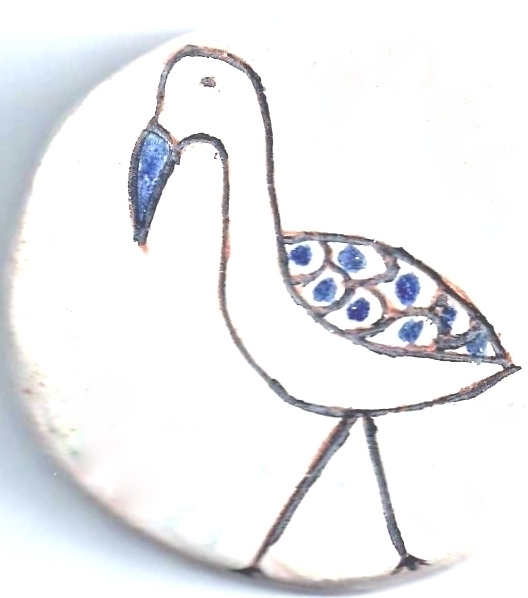 This entry was posted in Boats, Egypt, Luxor and tagged Boats, Drinking water, Egyptian Life, Ferries, Hotels, shopping, The Nile, Winter Palace. Bookmark the permalink. I did reply. I said …. Lovely and interesting, as usual.